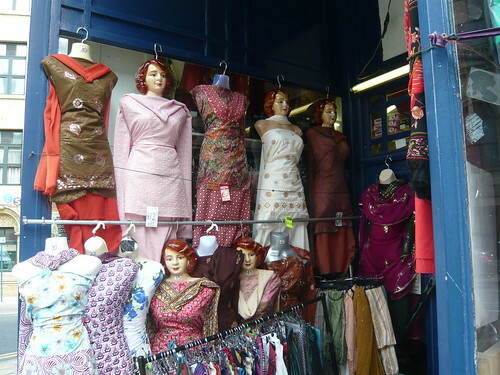 Wednesday and Saturday General Markets in Dewsbury are still the largest and most renowned market in Yorkshire. 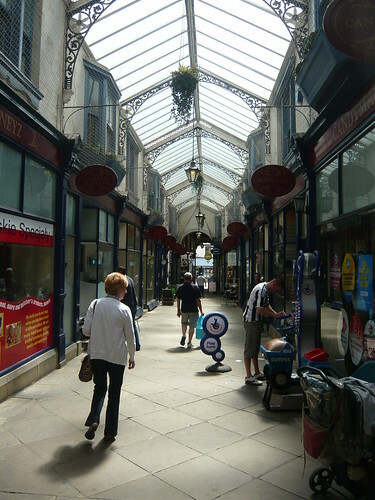 The open market boasts over 300 stalls and the permanent Victorian Market hall has a further 36. 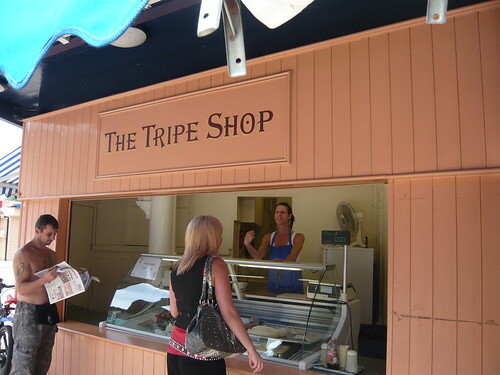 Amongst these permanent stalls is the famous ‘Tripe Shop’ shown above. On Fridays there is a Second-Hand Market with an array of goods and around 100 stalls each week, a bargain hunter’s paradise. Dewsbury is one of 4 minsters in Yorkshire. We all know York Minster and probably Beverley but Howden and Dewsbury Minsters were unknown to me. 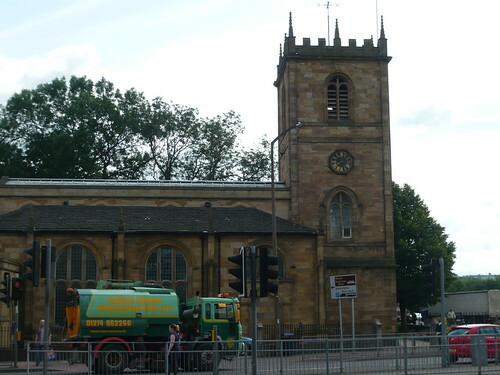 Dewsbury Minster dates back to Anglo-Saxon times.The Christian Community has met to worship on the site of the minster since AD 627. Now the Minster includes or is largely a heritage centre for the presentation of Anglo-Saxon sculpture and notable crosses. There is a newly created pilgrimage chapel to St Paulinus. Minsters differ from Cathedrals in that they are basically a monastery church or local collegiate church. The minster houses “Black Tom”, a bell which is rung each Christmas Eve. There is one toll for each year since Christ’s birth, and this is known locally as the “Devil’s Knell”. 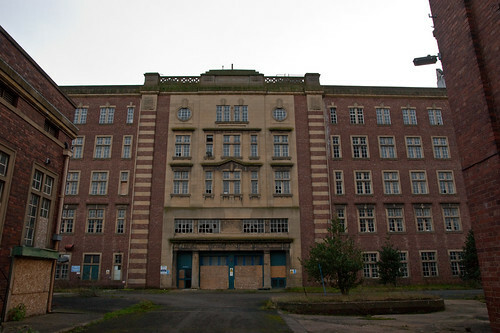 The population of Dewsbury in the Heavy Woolen District of Yorkshire is around 55,000. Dewsbury has been an important trading area for centuries. The river Calder, canal links and the railway all helped. There was a cloth market in Dewsbury from the 14th century. During the industrial revolution wool, cloth and textile engineering were major industries. Large immigration took place from the Indian Sub-continent when people arrived to work in the textile industry. Their influence is now very significant in the area. Aishah Azmi a local school teaching assistant gained notoriety in 2006 by refusing to remove her full-face veil in the classroom. Dewsbury Museum is located within the mansion house in Crow Nest Park. Fourteen buses are stored in a small building in Ravensthorpe, near Dewsbury as part of Dewsbury Bus Museum’s collection. Tradition records that Robin Hood is buried in the 12 century Cistertian convent that is now part of Kirklees Park. Bed manufacture is the main industry as textiles have dramatically reduced. Karen Matthews shocked the country when she came up with the plot to use one of her children in a fake kidnapping to claim reward money.With Paul Drake, aka Michael Donovan, she was found guilty on charges of kidnapping, false imprisonment, and perverting the course of justice and both were given eight-year prison sentences. Mohammad Sidique Khan lived in Lees Holm Dewsbury and became a suicide bomber when in July 2005 with 3 others he detonated bombs on three London Underground trains and one bus killing 55 people and injuring over 700. Several children aged 12- 15 were arrested in 2008 on suspicion of the murder of Amar Aslam. Amar was beaten so savagely that his body was initially unidentifiable. On 2 January 1981 Peter Sutcliffe, then calling himself Peter Williams was arrested before being transferring to Dewsbury. A knife was discovered in the toilets at the police station and eventually Sutcliffe confessed he was ‘The Ripper’. Not in the same league but Baroness Warsi has not been the sole of rectitude. First parliamentary expenses and then business dealings were questioned and the issues rumble on. The white rose of Yorkshire is the symbol for the House of York. From the fourteenth century it has also been the symbol for Yorkshire. 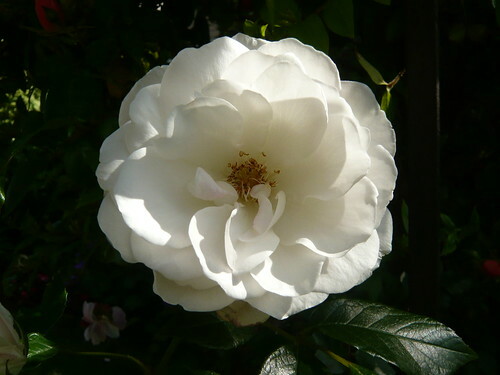 The symbolism of the white rose is said to relate to the Virgin Mary, who was known as the Mystical rose of heaven. White is a common colour for purity in religious ceremonies. The War of the roses was ended when King of England Henry VII united the warring factions and symbolically created the Tudor rose. At the Battle of Minden 1st August 1759, Yorkshire troops from a Yorkshire battalion were able to pluck white roses from close to the Battlefield in tribute to their fallen comrades. 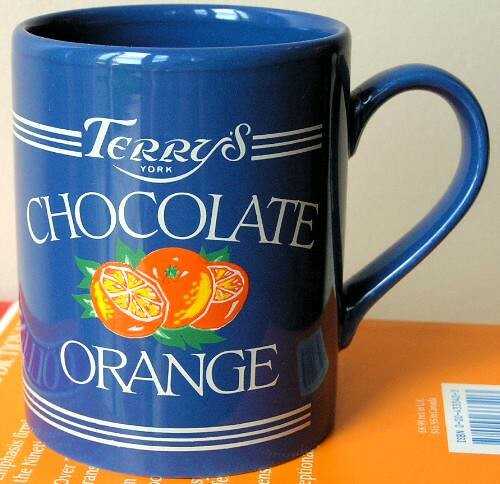 Ever since Yorkshire day has been celebrated on August 1st. During the Second World War, German students who resisted Hitler’s Nazi Regime founded the White Rose league – a movement seeking to overthrow Hitler and his party. The White Rose Universities is the group of Leeds, York and Sheffield universities. White Rose business Awards for 2013 opens for application in March. It is managed by ‘Welcome to Yorkshire’. White rose shopping centre is owned and managed by Land Securities and may feature hidden away in many Yorkshireman’s pension investments in some form. The White Rose credit union operates out of Wakefield the capital city of Yorkshire. Bradford is a major city in West Yorkshire. During the Nineteenth Century, Bradford was at the heart of the Industrial revolution and, for a time, was centre of the global wool trade. The British Wool marketing board is still based on Canal Road. Bradford currently has a population of 531,000 (2011 Census), and is part of the West Yorkshire Urban conurbation, which in 2001, had a population of 1.5 million. Bradford District is the fourth largest metropolitan district after Leeds, Birmingham and Sheffield The district has the largest proportion of people of Pakistani ethnic origin (20.3%) in England. The largest religious group in Bradford is Christian (45.9% of the population) and nearly one quarter of the population (24.7%) are Muslim. source data.gov 2016. 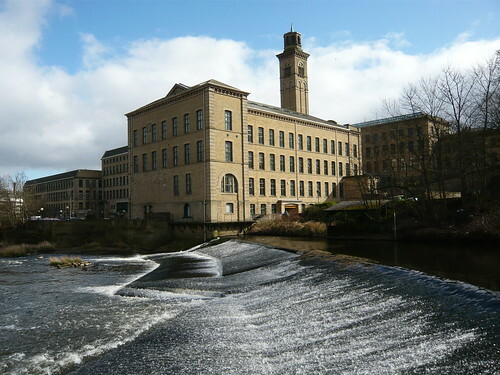 Bradford – is derived from Old English broad ford – The ford is at the site of the current Bradford Cathedral. 1251 Bradford granted market charter, centred on Kirkgate, Westgate and Ivegate. 1311 A survey of Bradford recorded the presence of a water mill, fulling mill, and 28 houses at its centre. 1642. During the civil war Bradford was occupied by Parliamentarian forces under Thomas Fairfax, though Royalist forces successfully besieged the town, leading to its surrender. In 1801 population of Bradford 6,393 – centre on small craft industries, such as wool spinning and cloth weaving. 1820s and 30s, Bradford received many German Jewish immigrants who settled in Mannignham, leading to the creation of an area known as ‘Little Germany’. German immigrants played a key role in the financing of industrial expansion. 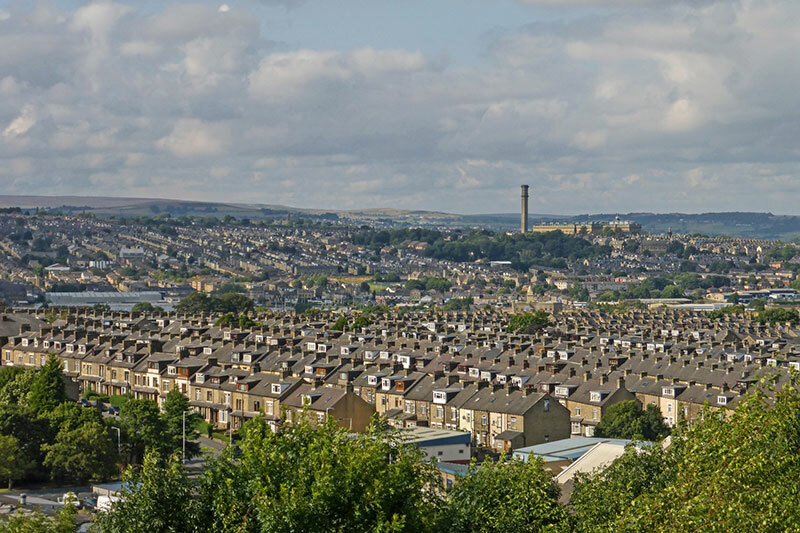 By 1851 the population of Bradford was 103,778 – making it one of the fastest growing cities in the world. As Bradford grew, it absorbed small townships which were previously separated, such as Manningham, Bowling, Thornton and Horton. 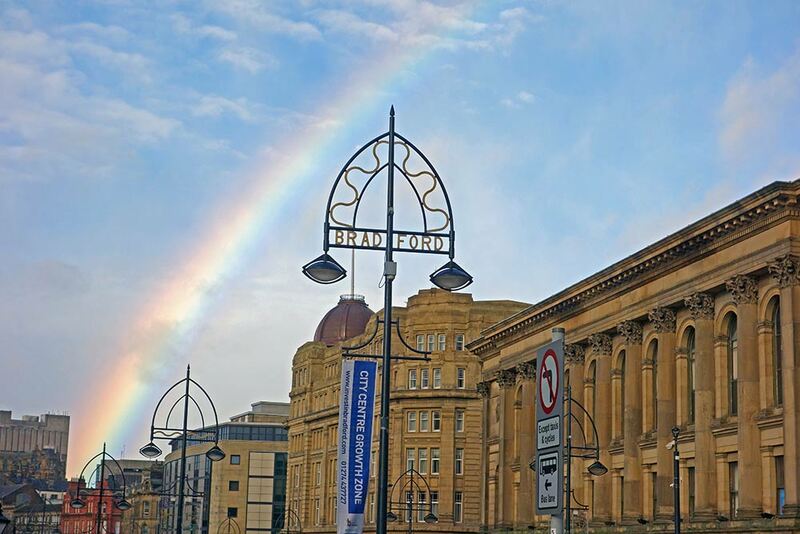 Bradford was a boom-town of the industrial revolution and often considered to be the epicentre of the global industrial revolution. The Large White pig, also known as the English Large White, is a breed of domesticated pig originating in Yorkshire. It is also fondly known as the Yorkshire pig. First recognized in 1868 and registered in 1884 this Yorkshire pig was popular around Keighley West Yorkshire for many years. Large Whites are distinguished by their hefty bearing, erect ears, slightly dished faces, white color, pink skins, and long deep sides. They have been valued for their bacon production since the inception of the breed. As their name suggests, they are characterized by their large size. The Large White is regarded as a rugged and hardy breed that can withstand variations in climate and other environmental factors. Their ability to cross with and improve other breeds has truly made them a factor nearly everywhere commercial swine are produced. They have been known for decades as a favorite market animal where high quality bacon and pork are sought. Their tendency to grow and not lay down excess fat have made them favorites, not only when swine are marketed at relatively light weights, but also when they are carried to heavier weights. Large Whites are known for large litters, heavy milk production and for having excellent maternal instincts. They are not only lean and active, but are also quite sound in feet and legs. They carry their considerable length with ease and grace. Their extra height, or length of leg, helps them to remain active and have long useful lives in the breeding pen. The Wensleydale is a large long wool sheep with a distinctive grey black face, ears and legs. The Wensleydale breed was developed in the 19th century by crossing English Leicester and Teeswater sheep to make a mule that developed in to the Wensleydale. One of the largest and heaviest of all sheep breeds, the Wensleydale has long, locks of ringlet like woll inherited from its teesdale parentage. There is a long show tradition for this breed and the 2016 winner at the 125th annual Wensleydale Longwool Sheep Breeders’ Association show and sale at Skipton Auction Mart. ‘A separate register is maintained in the flock book for coloured Wensleydales which occur naturally as a result of a double recessive black gene (this is not exclusive to the Wensleydale). Since the coloured register was commenced in 1994 the number of black ewe lambs registered with the Association has been volatile – in 1999 there were 88 registrations but these have declined in recent years. Some white animals carry one recessive black gene and mating two such sheep can produce coloured lambs from an apparently all white flock. These lambs are registered in the coloured register and the dam and sire must also be transferred out of the white flock. When the demand for wool was at its peak it was common for black lambs to be culled to prevent the valuable clip becoming ‘polluted’ with coloured fibres and to protect the reputation of breeders. However, these lambs born out of white flocks have now become very important as they widen the gene pool for coloured breeders – in 1999 breeding rams were registered from 13 flocks but by 2009 this had declined to 6 flocks. 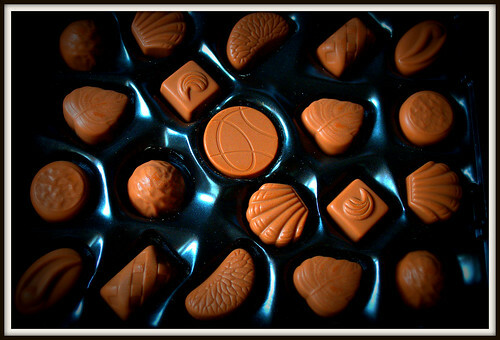 Snickelways were recently nominated as one of York’s seven man made wonders. Snickleways often lead the walker to fantastic pubs or act as short cuts to other watering holes. If you like maps then you will like this book. If you like quirky maps and routes you will love this book. If you like York, and who dosen’t, then you may have already got this book or one of the earlier editions. Written and published like the Alfred Wainwright’s Coast to Coast book in hand written text with drawn and sketched routes this book gives an exceptional insight in our York, past and present. For quirky who would have thought that Arthur Gemmell’s stile maps couldn’t be beaten for content or detail of presentation but they are? All these three cartographers Gemmill, Wainwright and Jones put the Frank Wilkinson walking series to shame from a cartographic perspective. So what on earth is a ‘Snickelway’? In Mark Jones eyes it is a cross or hybrid between a Snicket, a Ginnel and an Alleyway with the odd Court, Yard or Throughway thrown in for good measure. What is more he takes us on walks through 50 of them all within a quarter of a mile of ‘The Shambles.’ That would be 51+ Snickelways if you count the top of the wall. A complete walk would be in excess of 3 miles plus the wall if you choose to tackle it all in one go. My favourite review of the book says ‘ My wife and daughter set off after breakfast with a copy of Snickelways, and I am still waiting for them to get home to make my midday meal’. Angry York resident at teatime. Mark Jones should be an honourary memeber of the International Cartographers Society or you yourself may wish to be a member of the Map Collectors Circle. I doubt the Roadmap Collectors Association have discovered Snickelways yet. Look out for more humourous slogans on the snickleways of York. Opposite the Bluebell there is a T shirt shop with some great captions in the window. Try Too Beer or not two Beer’ Shakesbeer. Whitby – Home For Vampires That Fear The Light? Since Bram Stoker lit his first candle to see the ink drying on his story of Dracula the local vampires have preferred the night and twilight. So might you if you see the light like this around St Mary’s and the Abbey. Gouls, Goths and Vampires are generally portrayed in black but when shown in their true colours it can be quite illuminating. Can you see the vampires heading down the steps to the sea front? Mind how you go or we may never see you again. Take your own Vampire potions and protection with you if you venture out as the lights begin to twinkle, dim and then disappear as night sets in and Vampires start to roam. Avoid getting spooked, meeting a zombie or getting kissed on the neck in Whitby. On a positive note dawn has always returned, so far! This page has been designed in part to promote a series of Whitby photographs which use light in a variety of ways to emphasise the nature of our favourite Yorkshire seaside town. The real images are bigger better and dare I say it ‘more spooky’ but follow a successful, tried and tested theme. Similar works based on clever lighting of Ilkley Moor are available from retailers in Ilkley and a deal could be done for a Whitby organisation that sees the light. Contact Chris North Photography. Simon Clark is from Doncaster and is best known for his ‘The Night of the Triffids’ a sequel to Wyndham Lewis’s ‘The Day of The Triffids’. The sequel takes up the story twenty-five years later when the now grown-up son of Bill Masen is still searching for a method of destroying the implacable triffid plant as it continues its worldwide march. Simon also wrote many short stories and ‘Doctor Who Dalek Factor’. WGW is the Whitby Goth Weekend which runs from Halloween to Bonfire night. The big event 4th-6th November 2016 is sold out. This gathering of Steampunks, emos, goths, metallers, and other musical genres makes for a very suitable Whitby weekend home for ‘Vampires Who Fear The Light’. Let the light shine but not too brightly! 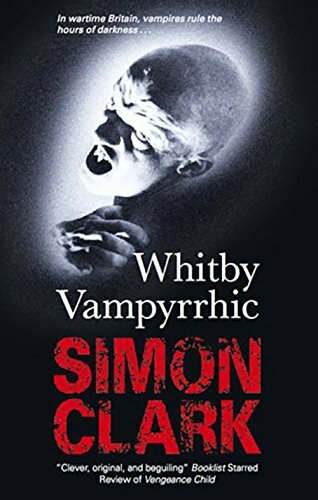 Author HortorisPosted on October 25, 2016 October 26, 2016 Categories Books Club & Literary Work, Yorkshire Arts & Music, Yorkshire Facts - Interesting and UnusualLeave a comment on Whitby – Home For Vampires That Fear The Light?